Customer Measurement | Market Force Information, Inc. This eBook explores methodologies and approaches for measuring customer experience in multi-location businesses. We look at pros and cons based on our experience with hundreds of client programs that address the needs of large and complex Fortune 10 brands with thousands of locations, to emerging brands with 100 or fewer locations. 5 February 2019 - A survey of customer experience (CX) in the UK’s casual dining restaurants has found that Wagamama leads the way in many key metrics. Market Force Information®, the leading CX management specialists, has revealed that Wagamama has the highest customer satisfaction, the biggest propensity to gain recommendations from diners and the most loyal customers on the high street. Respondents were asked to rate their overall satisfaction when dining at casual dining restaurants, on a scale of 1 to 5, with 5 representing extremely satisfied. Wagamama scored an impressive 4.23, with their nearest competitor being Nando’s. 46% of those surveyed said they would recommend Wagamama to their friends, with Nando’s again coming in second place at 38%. Wagamama also came out on top when it comes to customer loyalty, scoring 45% in Market Force’s composite loyalty index. Market Force rates the performance of restaurants using 10 key measures, all evaluated on a 1-5 scale. It then scores each restaurant based on the number of 5’s it achieves in each category. The table below reveals the scores achieved. The Casual Dining Index also revealed some key findings about how diners are increasingly relying on social media, and particularly Trip Advisor, to research before they book. A staggering 3 in 4 of respondents claimed to read review on a restaurant before booking. And almost half (44%) made their choice based on the reviews they read. It’s clear that having a positive overall Trip Advisor presence is a key part in future success. Of those diners that reported issues with restaurants in the casual dining sector, long wait times and poor food quality were the top problems. Casual dining is all about good, reasonably priced food, served efficiently and with minimal fuss. The restaurants that manage to eradicate these two issues are likely to be the ones that thrive in the future. Get in touch to learn more about the performance of the UK’s casual dining restaurants. Market Force Information® is a customer experience (CX) management company that provides location-level measurement solutions that help businesses protect their brand reputation, delight customers and make more money. Solutions include customer experience surveys, employee engagement surveys, mystery shopping, contact centre services and social media review tracking, which are integrated into one technology and analytics platform, KnowledgeForce®. Founded in 2005, Market Force has a growing global presence, with offices in the United States, Canada, United Kingdom, France and Spain. It serves more than 200 clients that operate multi-location businesses, including restaurants, major retailers, grocery stores, petrol stations/convenience stores, banking & financial institutions and entertainment brands. The company has been recognized as one of the top 50 market research organizations in the AMA Gold Report and by Forrester as a Breakout Vendor. * Whitbread brands have been combined. The specific restaurants are Beefeater, Brewers Fayre and Table Table. Is TripAdvisor on your side? One of the key findings of our recent research into customer experience at UK casual dining restaurants is the power of online social reviews, with the all-seeing TripAdvisor the most powerful of them all. With restaurant operators lagging behind Wagamama and Nando’s when it comes to quality of food, healthy food choices and speed of service, poor customer experiences are rife with over 1 in 5 customers dissatisfied. Customers care about the following combination of features during their experience – high quality food, good value for money, friendly and fast service, menu variety and, most importantly, the feeling that they are having an experience not just a transaction. Yet the research shows that of the diners who had a bad experience, 1 in 4 do not take their issues up with the restaurant at the time. Instead, a growing number of diners are posting their bad experiences on review sites to warn others of their less than satisfactory experiences. TripAdvisor is revealed as the go-to site for casual dining reviews, dwarfing nearest rival Facebook and accounting for a massive 75% of all social media/review sites used by diners. Restaurant operators will often find out from posts on TripAdvisor when their food is of poor quality or extended wait times, long after the customer has left the restaurant. There are lessons to learn from social monitoring and regular management of review sites such as TripAdvisor. The encouragement of complaint handling will go a long way to stemming the tide of negative reviews. However, until some brands up their game on what diners are looking for, they will continue to offer a customer experience that is not worth a diner repeating. It is clear that online reputation and overall customer experience are big influencers when it comes to casual dining. With the insights that our research can provide, operators can identify the weaknesses in their dining model and target improvements in their business. Market Force has years of experience in working with these restaurants to drive the right customer outcomes. If you feel you could benefit from a review of your approach, then just get in touch. Our latest research into the casual dining customer experience in the UK has shown that Wagamama leads the way, leveraging its high quality food, menu variety, friendly service and healthy food choices to gain top spot. While other operators struggle to get this recipe right, Wagamama achieves high satisfaction levels as a result of focusing on the ‘customer first’, ensuring that visitors are delighted by their experience and go on to recommend the restaurant whether by word of mouth or, more likely, social media and review sites. Our study shows that the UK home of pan-Asian cuisine is diners’ top choice for trying something new! And it is important to remember that delivering satisfaction on the first visit is key in outperforming other casual dining operators – because nearly half of visitors are likely to recommend the experience to family and friends. Contributing to this loyalty is Wagamama’s proficiency dealing with complaints and resolving issues. Of the few diners who encountered problems, over 60% reported that their issue was dealt with satisfactorily, again the top performing restaurant by this measure. Along with ensuring polished service and an attractive restaurant environment, it’s clear that the investment in offering customers what they want – expanding menus to offer more vegan and gluten free options and showing awareness of food allergies – makes the difference in creating a true experience and not just a meal transaction. For the restaurant industry, getting customer experience right is critical. If you’d like to talk to us about how we can help you gain insight and implement measures to improve then get in touch. As contact centers push to shrink cost and increase efficiency in light of increased consumer demands, live chat is seeing a resurgence as a go-to customer support channel. 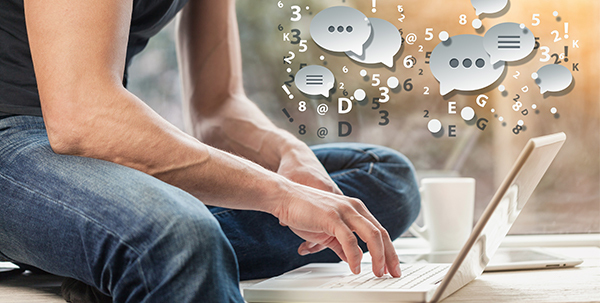 We recently picked the brain of Ryan Stewart, our Vice President of Canadian Operations and Global Contact Center, to learn why chat is gaining in popularity, how it compares to other customer communication channels and which organizations should be using it. 1. Chat has been around for two decades, yet it recently seems to playing a larger role in the contact center. Why do you think that is? Chat was previously a staple in high-end tech support, as well as for website support in retail and other industries where better website engagement translates into better sales. However, in today’s contact center, we’re primarily focused on the convenience of live chat for the customer. As society becomes more connected through mobile devices with fast data transfer rates, channels such as chat are seen as a quick way for consumers to get the information they need promptly and conveniently. Speed is key, and contact centers that are leveraging live chat to offer quick response service levels and are responding to this consumer desire. What’s more, chat is more economical for contact centers and their clients because it enables customer service associates to handle multiple chat conversations simultaneously, as opposed to a single voice or email engagement. That’s one reason why phone and email are taking a back seat to more cost-effective concepts such as FAQs, IVR self-service and chat, and why restaurant chains and other non-traditional markets are really starting to implement it. 2. Do you find most consumers like to use of chat for customer support? In my experience, two factors drive consumers to use chat: speed and trust. Those looking for a quick answer to a question are more inclined to use the chat feature on a company’s website, rather than to pick up the phone and engage in dialogue with a customer service agent. There are different etiquette rules when it comes to chat – a customer can simply disconnect after they have their answer, whereas those having a phone conversation feel obligated to make small talk and use pleasantries. Trust is usually associated with the subject matter of the conversation. We find that consumers are more apt to pick up the phone to speak with someone if the topic concerns financials or compensation. Many also have the perception that they can influence a decision in their favor if they have a voice conversation with someone because it’s more personal. So, those hoping for a refund or some sort of compensation for a bad customer experience tend to call rather than to engage in live chat. 3. Does using live chat for customer support make more sense in some industries versus others? Chat is a viable support channel for any organization that has customers or partners who would elect to use chat to conduct business. It’s worth exploring for most companies that offer a service that requires either pre-sales, post-sales or product support. Companies that wish to build a reputation for support should focus on customer convenience and, as such, offer multiple channels through which customers can reach and interact with the company. Chat is a quick response, convenient and mobile option that is quickly becoming adopted by most sectors. The key is to make it easy for your customers to connect with your customer support team in whatever way works best for them. Rebecca Scanlan is a strategic communications professional in the CX space who has been working with Market Force Information for over 10 years optimizing online presence and brand identity through media relations and global PR messaging and positioning. My office is located in Peachtree Corners, Georgia and for as long as I can remember, there’s been a Chick-fil-A right around the corner. I’ve loved having it there because it’s a tremendously convenient and great-tasting option for when I need something good to eat and quickly get back to the office. In fact, the drive-thru’s always really impressed me, on the rare occasion that I don’t go in. Around lunch time the line almost always wraps around the store. That said, the efficiency of their execution is spectacular. After I place my order and drive around, I hand the guy my debit card - and now the real magic happens - he hands me my food, swipes my card and hands me my receipt in one big fluid motion! 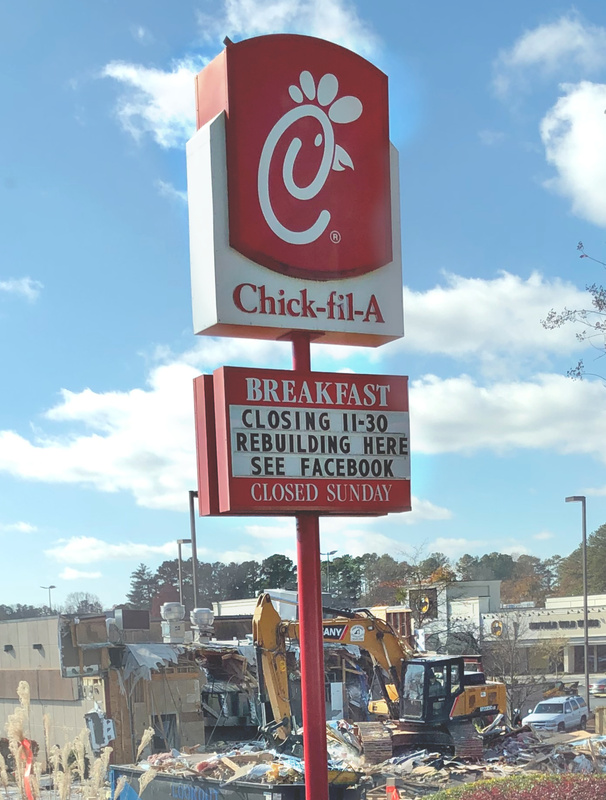 Back in November, I watched in horror as bulldozers starting plowing my creature comfort chicken chain down to the ground. I drove by, looked out my window and saw nothing but collapsed building, dirt and heavy construction equipment. Because I work in the industry and consult with a number of restaurant executives on customer experience, I immediately began doing the math on this. I tried to calculate what this owner operator must be losing in missed sales revenue each month that their store is no more. Then I thought about the cost of the demolition and the expense of building a new one from scratch. While I don’t know what this particular store’s revenues are, I’m confident that this is a good Chick-fil-A store. It is usually really busy. I’d read a fact about Chick-fil-A restaurants once back in 2014 that their AUV (average unit volume) - annual sales revenue for the year – was approximately $3.1M per store. To put that in perspective, the same store sales volume for KFC restaurants during that time was $960K. So Chick-fil-A stores 3X similar chicken QSRs. This store is likely higher than average, if the number of cars and people there at lunch are any indication. I was disappointed that I was going to need to look for other quick lunch options nearby for some unknown period of time, but at the same time, I was struck by the commitment by this brand. They were tearing down this perfectly productive unit to create an ever better experience; larger lobby, more efficient drive thru and cleaner/newer building materials. I immediately contrasted that to the practice of some restaurant organizations that allow their operators to run lifestyle businesses simply extracting cash out of the unit. Never investing in the asset. Never upskilling their people. Never giving consumers a new reason to experience the brand again. Kudos to Chick-fil-A and this particular operator for their commitment to continual improvement and an almost maniacal focus on delivering the optimal customer experience. They know that this kind of investment has the very best ROI; it protects the brand’s reputation, it delights customers and enables them to make more money. I cannot think of a more effective strategy. Our latest research on Quick Service Restaurants (QSR) in the UK has shown that basic customer experience (CX) measurements are being overlooked. Across various restaurant categories, inaccurate orders, long wait times and poor staff attitudes are big areas of concern, hampering the future success of many of the eateries on the UK high street. As an example, let’s look at the burger and chicken sector; almost half of diners who were surveyed in our recent performance index reported inaccurate orders and 4 in 10 of those diners experienced excessively long wait times. In addition, 20% faced bad attitudes from staff. These CX challenges are not confined to just burger and chicken establishments. Visitors to leading coffee shops also experienced dissatisfaction, with a quarter of those surveyed revealing the same disappointing experiences with service. And a third of diners at more upmarket restaurants reported issues with inaccurate orders and long wait times, also with 20% complaining about poor staff attitudes. It’s no secret that competition is fierce on the UK high street. Ensuring that guests are receiving excellent service – or at the very least, having their dissatisfaction addressed, can be the difference between success and failure. In the past year alone the industry saw popular Italian restaurants like Jamie’s Italian, Strada, Carluccio’s and Prezzo experience a significant number of location closures. It is a tough market to succeed in, and with access to countless social media channels at our fingertips, it is all too easy for a guest to tell the world about their (bad) experience. Restaurants that effectively address these challenges are more than likely to thrive well into the future. Not only are dine-in guests reporting bad experience, the proliferation of food delivery services are extending the restaurant’s reach into guest’s homes. 4 out of 10 respondents reported dissatisfaction with delivery speed and, perhaps even more importantly, with the quality of the food. At a period in time when consumers are time poor and would like the convenience of quality food delivered to their door, this is a worryingly high figure. Getting CX right is critical for a restaurant’s continued success. If you’d like to talk to us about how we can help you implement measures to improve your CX programme, please get in touch. Just as the dust has settled, along comes a new shift in the data protection landscape. The CCPA is not an American GDPR. There are substantial differences between the two regimes; the GDPR restricts the collection of personal information unless certain conditions exist, where no such restriction is found under the CCPA . The definition of personal information is also potentially broader under the CCPA than under the GDPR as it includes “information that identifies, relates to, describes, is capable of being associated with, or could reasonably be linked, directly or indirectly, with a particular consumer or household”. Despite these differences, there are certainly learnings from the work preparing for the GDPR that can applied to the CCPA. The GDPR took four years to negotiate; the CCPA was passed in only 7 days. As such, business communities are calling for changes, as expected. However, the scope and extent of those changes likely to be limited to tidying up some aspects of technical language only; the main principles are expected to remain as they are at present. With that in mind, businesses are well served to start preparing for January 2020, when the act will take effect. Below are our top recommendations of leveraging GDPR to operationalise CCPA. The CCPA will introduce the right of information and the right of access. These rights will both oblige businesses to provide consumers with certain information at the time of collecting their personal information, and will permit those eligible under the Act to see what information is being held. The purposes for which the categories of personal information will be used. Furthermore, businesses will be unable to collect additional categories of personal information or use personal information collected for additional purposes without providing individuals with appropriate information and notice. In the wake of GDPR, there are now some great examples of clear, unambiguous and intelligible privacy notices, which provide enough guidance without being unnecessarily complicated or complex. Similar to the GDPR, contractual obligations flow down under the CCPA. If you use service providers, you want to be sure that you have a written contract in place to ensure that they will comply with your instructions and help you comply with your obligations. For example, if you receive a valid request from a consumer, asking you to delete their information, you need to direct any service providers to delete the same personal information from their records. As you collect information on your customers to inform your customer experience programmes, make sure that you’re getting into a practice that protects personal information by design and defaut. We can assist you. Each month we collect, process and analyse millions of employee and customer experience surveys; manage over 100,000 inbound calls to our contact centres, and complete over 100,000 mystery shops. The new world of GDPR, and soon CCPA, needs to become part of the way you do business. Businesses that don’t think reviews on social media matter are making a huge mistake. Users on social media platforms can have an immediate and deleterious impact on the bottom line. Just ask the Starbucks CEO after staff at a Philadelphia store called police on two African American men waiting to meet a friend. The interaction was caught on a smartphone and went viral. What followed was the shutdown of all locations nationwide as a training was conducted for all employees. Or recall the Pizza Hut viral video of rats scampering inside a New York location. In that case, not only did the company endure the negative publicity on social media, but was forced to shut down 13 locations. Social media reviews have become part of the decision-making process for countless consumers. Studies peg the percentage of consumers that check out online reviews at more than 80%. That means a majority of online shoppers rely on feedback from other consumers when making purchases. These reviews are powerful too: around the same percentage of consumers will not purchase a product if it gets a substantial number of bad online reviews. Before the advent of the internet, Americans got their read on new restaurants, movies and products from professionals who were paid to review a product or service. Nowadays, they get opinions from real people who have actual real-life experiences with the things they're reviewing. As a result, people really trust online reviews. Star ratings have also become prevalent because they’re a quick way for consumers to size up the sentiment about a business or service. It’s an easy system to understand, and they seem to matter to consumers just as much – if not more – as online reviews. Positive social media reviews can also help a business get noticed outside of the social networks themselves. The more positive reviews a business has, the higher up they will move in the website’s directory. That, in turn, increases the odds the consumer sees the business and patronizes it rather than a lower-ranked competitor. It can also drive more local business. Consumers will check out reviews about a local business before visiting it. If they find nothing or, worse, bad reviews, they may be just skip it and go somewhere else. We can all agree that social media reviews need to be handled, so how do you best go about it? Here are some best practices that can help guide the way. The challenge is how to manage social reviews. The first step is making sure that your patrons have a good customer experience in the first place. This is especially difficult for multi-location businesses with hundreds or thousands of locations. Ensuring an excellent customer experience requires ongoing intelligence into how each location is performing – and it’s virtually impossible to have eyes and ears in every store to report back. This leads most restaurant, retail, grocery and other major chains to implement widespread mystery shopping programs. These program give businesses the insights they need to deliver an impeccable customer experience in each location, which, in most cases, will lead to an uptick in positive reviews. Another good step is deploying an employee survey to assess if you’re employees are happy, satisfied and engaged – all factors that can be reflected in the customer experience and, thus, in customer reviews. Companies like In-N-Out Burger are known for paying well, adequately training staff and having strong management. And it shows. The front lines have enabled In-N-Out to attain a loyal customer base that consistently rank the chain as their favorite burger restaurant. Making sure you’re taking care of employees adequately who are in your front lines pays off in more ways than one. Nevertheless, no matter how well a location is managing the customer experience, a mistake will be made or a customer will be irate for an unforeseen reason. In this case, it is extremely important that the guest be heard. Employees should be trained to handle these cases on the front lines, but guests tend to complain more online rather than approaching the staff with their issues. One negative comment can undo the goodwill from dozens of positive ones. For this reason, businesses should have a contact center staffed with live agents who monitor and respond to mentions of your brand. Live agents can engage one on one to recover unhappy customers and to move the negative conversations offline. At the same time, they can also thank customers for calling out a service they loved at a location, and sincere appreciation can go a long way in consumers’ minds. Businesses can also have success by amplifying good reviews. For example, a hotel chain asked guests who filled out an online survey whether they would like to post the review on TripAdvisor with one click. It turned out that almost half of the TripAdvisor reviews were from that mechanism. It’s a simple process to put in place with sizeable results. Social media now plays a big role in how consumers make choices of where to eat, shop, what hotel to stay at and what movie to see. An effective social media strategy includes making sure you’re delivering a good customer experience in the first place, as well as a instituting a program to scour the social media universe and respond quickly and professionally to make things right. What the community of millions, if not billions, of people are saying on these social networks can make the difference between a company succeeding and failing. It transcends size and scope of the business. Any size company that ignores the power and potential of social media reviews does so at their own peril. Barbara Cummings is a digital marketing strategist who’s helped businesses from Fortune 500 to small nonprofits with their online presence and building a smart brand identity through their promotion and marketing campaigns. PEACHTREE CORNERS, Ga., Aug. 6, 2018 — Back Yard Burgers, a pioneer in the better burger category, and Market Force Information® (Market Force), a leader in customer experience management, are commemorating five years of partnership focused on creating an exceptional customer experience for every Back Yard Burgers guest. In 2013, Back Yard Burgers enlisted Market Force to improve the overall guest experience, delight guests and increase same-store sales. For five years, Market Force has been conducting guest experience surveys for the fast-casual brand’s 51 locations in 11 states. The data collected from the surveys is made available in Market Force’s KnowledgeForce® analytics platform, empowering the Back Yard Burgers leadership team and franchise partners to better understand what actions need to be taken to attract and retain customers. The insights gleaned from KnowledgeForce have enabled Back Yard Burgers to target improvements at the location level and raise its overall satisfaction (OSAT) scores nearly 20 percent in five years. Market Force Information® is a customer experience (CX) management company that provides location-level measurement solutions that help businesses protect their brand reputation, delight customers and make more money. Solutions include customer experience surveys, employee engagement surveys, mystery shopping, contact center services and social media review tracking, which are integrated into one technology and analytics platform, KnowledgeForce®. Founded in 2005, Market Force has a growing global presence, with offices in the United States, Canada, United Kingdom, France and Spain. It serves more than 200 clients that operate multi-location businesses, including restaurants, major retailers, grocery and drug stores, petro/convenience stores, banking & financial institutions and entertainment brands. The company has been recognized as one of the top 50 market research organizations in the AMA Gold Report. For more information about Market Force, please visit us online www.marketforce.com.